This route is a very difficult climb, and not for the faint of heart. It’s important to prepare mentally and physically prior to this challenge. 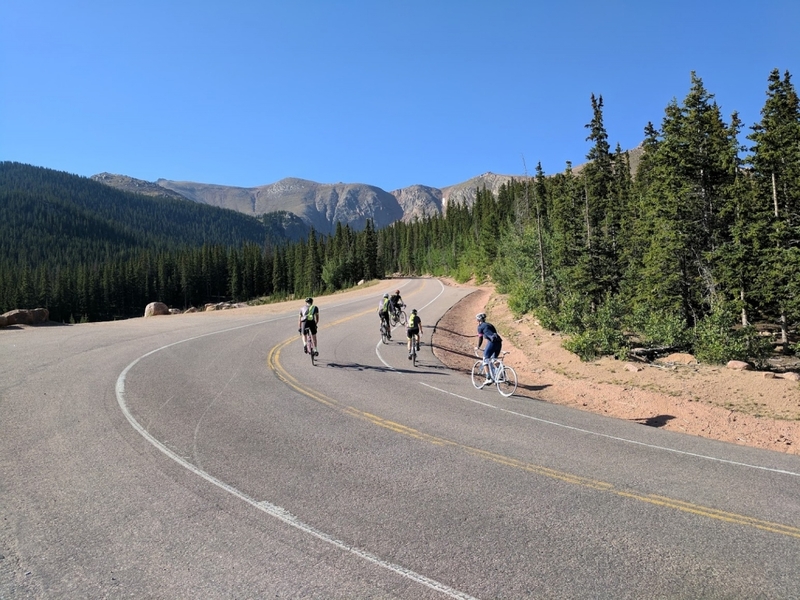 Riding towards the summit, the climb is a sustained average of 6% with 5,000k-6,600+ feet of climbing. 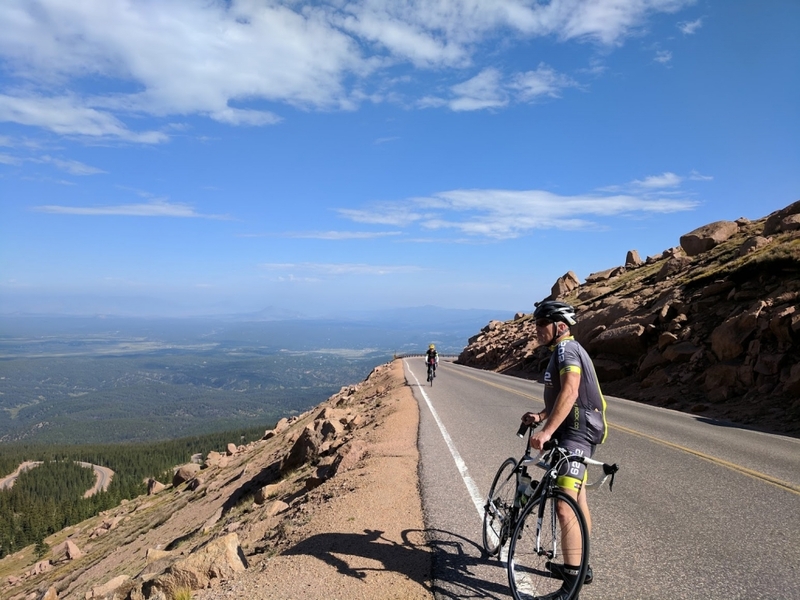 Due to the altitude, it is only available to ride in the warmer months. All season long, the temperatures will vary between base and summit temps, time of day, and ascending vs. descending, so removable layers (arm and leg warmers, vests, etc.) are advised. Parking can be done at the Crystal Reservoir Visitor Center. There is a fee of $15 bucks per person or $50 for a car up to five people (for the carpooling). Bring cash. There will be plenty of climbing and views: that’s a given. There is a rest stop part way up in the form of a gift shop. There is food and water here as well as an opportunity to grab a souvenir or two in case the gift shop at the peak is a bit too busy. 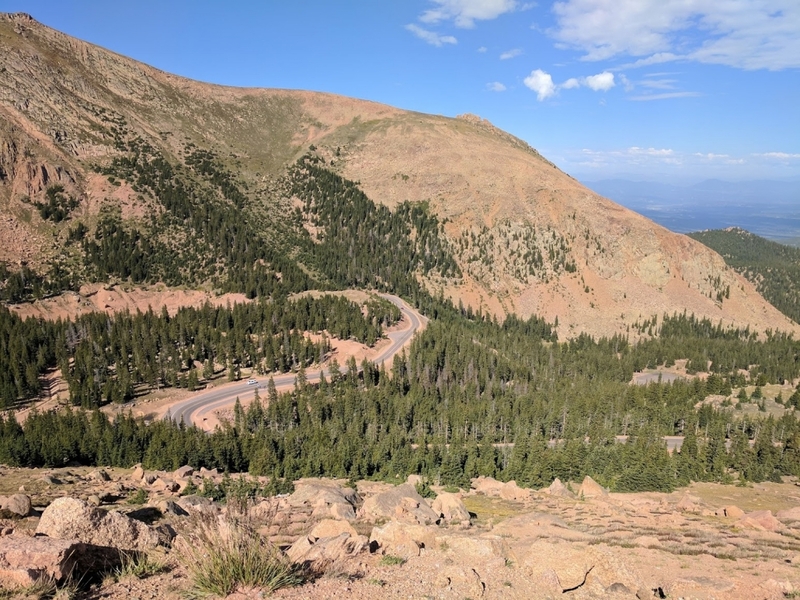 Another popular bucket list climb in Colorado is Mount Evans. Because both mountains are 14ers, they are often compared to each other. However, they are very different experiences on the bike. With Evans and Pikes, both have thin air and unpredictable weather to deal with. On Evans, the ascent is very steady with a 5% grade for most of it. It’s easy to get in the zone and have a comfortable climb to the top. The descent of Evans is quite rough due to the conditions of the road. 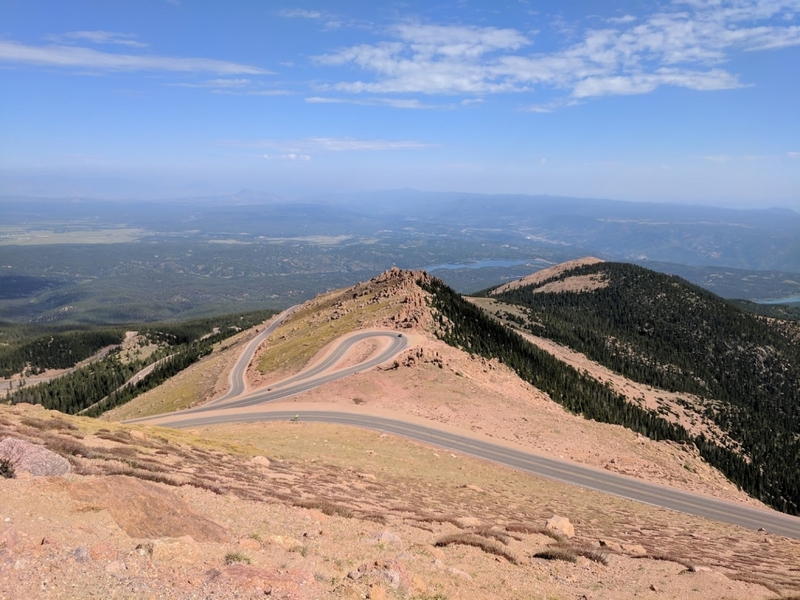 Comparibly, Mount Evans is considered by many to be the easier climb of the two. It maxes out around 6.3%, where as Pikes Peak averages 6.4%. The climbs have a few false flats and slight descents that lead to steep grades. It’s these irregularities that make it difficult to build a pace. It’s a roller coaster where you can spend an hour averaging a 9% grade, descend at -3% for 30 seconds, and then hit 12% right away. This ride is a physical, but also a mental challenge. At the top, there is a huge gift shop and a gravel parking lot to take in the views, refuel, and recover. 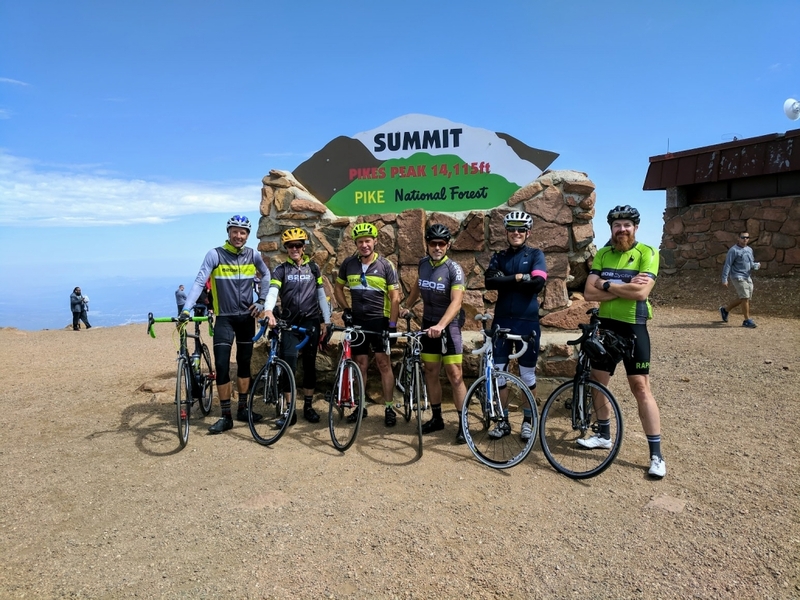 More importantly is to take in the tradition of eating Pike’s “World Famous Donuts.” Doughnuts have been served on the summit for more than a century. Bakers use a very specific high-altitude formula to overcome the challenges of creating a cake doughnut above 14,000 feet. This is also a great opportunity to throw on warmer kit accessories for the often chilly descent. On the way down, there is a stop used to check vehicles and bikes for brake overheating. This is where that first gift shop is found. Overheating is a real issue when descending Pike’s. Last year, we witnessed the wheels of the truck in front of our group start smoking on the way down. It is important to understand the limits of your skill level and bike and apply them carefully. We’ve planned out two routes. The ‘trimmed’ route starts at the lake and moves north to the peak. This is the shorter of the two. The second will push your limits by parking at the lake for the convenience, but you begin your ride by descending to the base before climbing back up to the peak. 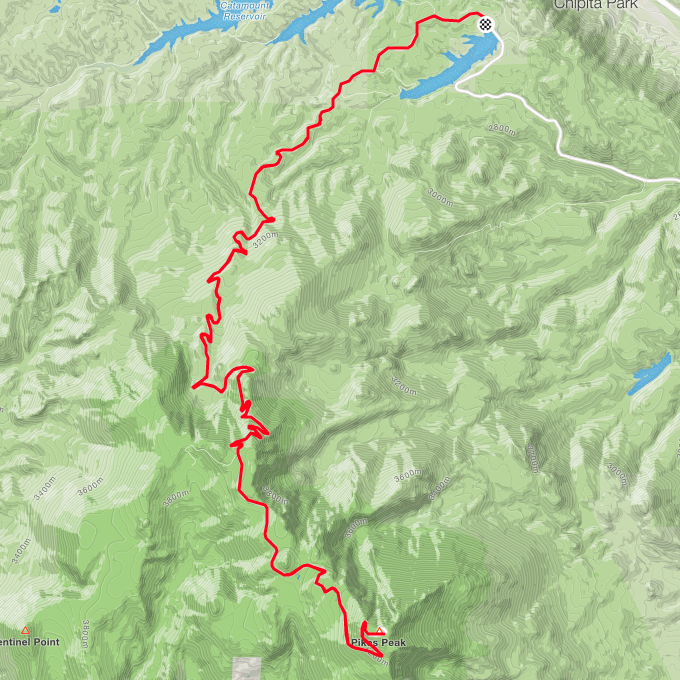 This ‘full’ route adds 10 miles and 1,600 feet of climbing. If you start early in the morning, you might pack warmer gear than you will need in the morning. 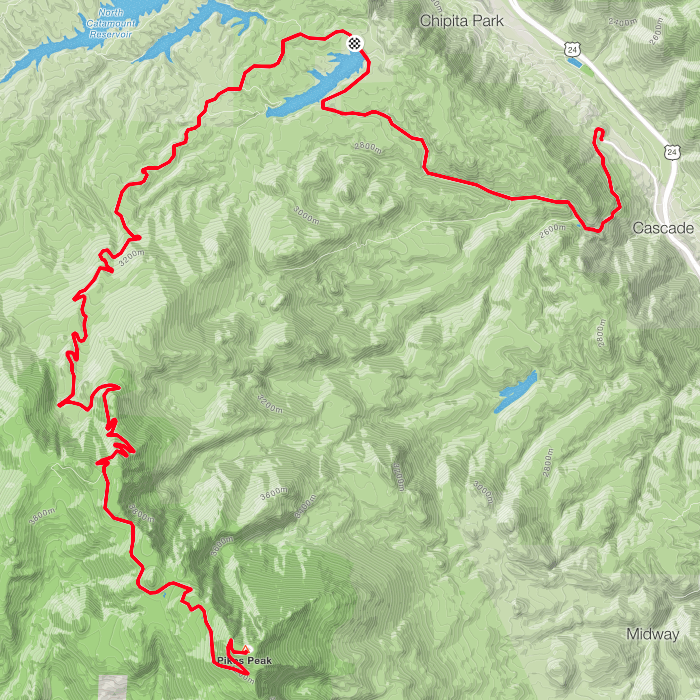 If you do the full route, you get the benefit to stop by the parking lot on the way up, use the bathroom, refuel, and adjust your kit for the rest of the climb accordingly. This is a condensed that is a good option if you are limited by time or skill level. If you tackled the trimmed route without any issue, then try this extension.